For other uses, see Batik (disambiguation). Batik[n 1] is a technique of wax-resist dyeing applied to whole cloth, or cloth made using this technique, originated from Indonesia,  Batik is made either by drawing dots and lines of the resist with a spouted tool called a tjanting,[n 2] or by printing the resist with a copper stamp called a cap. [n 3] The applied wax resists dyes and therefore allows the artisan to colour selectively by soaking the cloth in one colour, removing the wax with boiling water, and repeating if multiple colours are desired. A tradition of making batik is found in various countries; the batik of Indonesia, however, may be the best-known. Indonesian batik made in the island of Java has a long history of acculturation, with diverse patterns influenced by a variety of cultures, and is the most developed in terms of pattern, technique, and the quality of workmanship. In October 2009, UNESCO designated Indonesian batik as a Masterpiece of Oral and Intangible Heritage of Humanity. The word batik is Javanese in origin. It may either come from the Javanese word amba ('to write') and titik ('dot'), or may derive from a hypothetical Proto-Austronesian root *beCík ('to tattoo'). The word is first recorded in English in the Encyclopædia Britannica of 1880, in which it is spelled battik. It is attested in the Indonesian Archipelago during the Dutch colonial period in various forms: mbatek, mbatik, batek and batik. Wax resist dyeing of fabric is an ancient art form. It already existed in Egypt in the 4th century BC, where it was used to wrap mummies; linen was soaked in wax, and scratched using a stylus. In Asia, the technique was practised in China during the Tang Dynasty (618-907 AD), and in India and Japan during the Nara Period (645-794 AD). In Africa it was originally practised by the Yoruba tribe in Nigeria, Soninke and Wolof in Senegal. These African version however, uses cassava starch or rice paste, or mud as a resist instead of beeswax. The art of batik is most highly developed in the island of Java in Indonesia. In Java, all the materials for the process are readily available — cotton and beeswax and plants from which different vegetable dyes are made. Indonesian batik predates written records: G. P. Rouffaer argues that the technique might have been introduced during the 6th or 7th century from India or Sri Lanka. On the other hand, the Dutch archaeologist J.L.A. Brandes and the Indonesian archaeologist F.A. Sutjipto believe Indonesian batik is a native tradition, since other regions in Indonesia such as Toraja, Flores, Halmahera, and Papua, which were not directly influenced by Hinduism, have an age-old tradition of batik making. Rouffaer reported that the gringsing pattern was already known by the 12th century in Kediri, East Java. He concluded that this delicate pattern could be created only by using the canting, an etching tool that holds a small reservoir of hot wax, and proposed that the canting was invented in Java around that time. The carving details of clothes worn by East Javanese Prajnaparamita statues from around the 13th century show intricate floral patterns within rounded margins, similar to today's traditional Javanese jlamprang or ceplok batik motif. The motif is thought to represent the lotus, a sacred flower in Hindu-Buddhist beliefs. This evidence suggests that intricate batik fabric patterns applied with the canting existed in 13th-century Java or even earlier. In Europe, the technique was described for the first time in the History of Java, published in London in 1817 by Stamford Raffles, who had been a British governor for Bengkulu, Sumatra. In 1873 the Dutch merchant Van Rijckevorsel gave the pieces he collected during a trip to Indonesia to the ethnographic museum in Rotterdam. Today the Tropenmuseum houses the biggest collection of Indonesian batik in the Netherlands. The Dutch and Chinese colonists were active in developing batik, particularly coastal batik, in the late colonial era. They introduced new patterns as well as the use of the cap (copper block stamps) to mass-produce batiks. Displayed at the Exposition Universelle at Paris in 1900, the Indonesian batik impressed the public and artists. In the 1920s, Javanese batik makers migrating to Malaya (now Malaysia) introduced the use of wax and copper blocks to its east coast. In Subsaharan Africa, Javanese batik was introduced in the 19th century by Dutch and English traders. The local people there adapted the Javanese batik, making larger motifs with thicker lines and more colours. In the 1970s, batik was introduced to Australia, where aboriginal artists at Erna Bella have developed it as their own craft. Batik craftswomen in Java drawing intricate patterns using canting and wax that are kept hot and liquid in a heated small pan. Firstly, a cloth is washed, soaked and beaten with a large mallet. Patterns are drawn with pencil and later redrawn using hot wax, usually made from a mixture of paraffin or beeswax, sometimes mixed with plant resins, which functions as a dye-resist. The wax can be applied with a variety of tools. A pen-like instrument called a canting (Javanese pronunciation: [tʃantiŋ], sometimes spelled with old Dutch orthography tjanting) is the most common. A tjanting is made from a small copper reservoir with a spout on a wooden handle. The reservoir holds the resist which flows through the spout, creating dots and lines as it moves. For larger patterns, a stiff brush may be used. Alternatively, a copper block stamp called a cap (Javanese pronunciation: [tʃap]; old spelling tjap) is used to cover large areas more efficiently. Applying wax using cap (copper plate stamps). After the cloth is dry, the resist is removed by boiling or scraping the cloth. The areas treated with resist keep their original colour; when the resist is removed the contrast between the dyed and undyed areas forms the pattern. This process is repeated as many times as the number of colours desired. The most traditional type of batik, called batik tulis (written batik), is drawn using only the canting. The cloth needs to be drawn on both sides, and dipped in a dye bath three to four times. The whole process may take up to a year; it yields considerably finer patterns than stamped batik. Many Indonesian batik patterns are symbolic. Infants are carried in batik slings decorated with symbols designed to bring the child luck, and certain batik designs are reserved for brides and bridegrooms, as well as their families. Some designs are reserved for royalties, and even banned to be worn by commoners. Consequently, a person's rank could be determined by the pattern of the batik he or she wore. Batik garments play a central role in certain Javanese rituals, such as the ceremonial casting of royal batik into a volcano. In the Javanese naloni mitoni ceremony, the mother-to-be is wrapped in seven layers of batik, wishing her good things. Batik is also prominent in the tedak siten ceremony when a child touches the earth for the first time. In October 2009, UNESCO designated Indonesian batik as a Masterpiece of Oral and Intangible Heritage of Humanity. As part of the acknowledgment, UNESCO insisted that Indonesia preserve its heritage. The day, October 2, 2009 has been stated by Indonesian government as National Batik Day, as also at the time the map of Indonesian batik diversity by Hokky Situngkir was opened for public for the first time by the Indonesian Ministry of Research and Technology. Study of the geometry of Indonesian batik has shown the applicability of fractal geometry in traditional designs. The popularity of batik in Indonesia has varied. Historically, it was essential for ceremonial costumes and it was worn as part of a kebaya dress, commonly worn every day. The use of batik was already recorded in the 12th century, and the textile has become a strong source of identity for Indonesians crossing religious, racial and cultural boundaries. It is also believed the motif made the batik famous. The batik industry of Java flourished from the late 1800s to early 1900s, but declined during the Japanese occupation of Indonesia. With increasing preference of western clothing, the batik industry further declined following the Indonesian independence. Batik has somewhat revived at the turn of the 21st century, through the efforts of Indonesian fashion designers to innovate batik by incorporating new colours, fabrics, and patterns. Batik has become a fashion item for many Indonesians, and may be seen on shirts, dresses, or scarves for casual wear; it is a preferred replacement for jacket-and-tie at certain receptions. Traditional batik sarongs are still used in many occasions. After the UNESCO recognition for Indonesian batik on 2 October 2009, the Indonesian administration asked Indonesians to wear batik on Fridays, and wearing batik every Friday has been encouraged in government offices and private companies ever since. 2 October is also celebrated as National Batik Day in Indonesia. Batik had helped improve the small business local economy, batik sales in Indonesia had reached Rp 3.9 trillion (US$436.8 million) in 2010, an increase from Rp 2.5 trillion in 2006. The value of batik exports, meanwhile, increased from $14.3 million in 2006 to $22.3 million in 2010. Batik is also popular in the neighbouring countries of Singapore and Malaysia. It is produced in Malaysia with similar, but not identical, methods to those used in Indonesia. Prior to UNESCO's recognition and following the 2009 Pendet controversy, Indonesia and Malaysia disputed the ownership of batik culture. However, Dr Fiona Kerlogue of the Horniman museum argued that the Malaysian printed wax textiles, made for about a century, were quite a different tradition from the "very fine" traditional Indonesian batiks produced for many centuries. Batik is featured in the national airline uniforms of the three countries, represented by batik prints worn by flight attendants of Singapore Airlines, Garuda Indonesia and Malaysian Airlines. The female uniform of Garuda Indonesia flight attendants is a modern interpretation of the Kartini style kebaya with parang gondosuli motifs. Batik is traditionally sold in 2.25-metre lengths used for kain panjang or sarong. It is worn by wrapping it around the hip, or made into a hat known as blangkon. The cloth can be filled continuously with a single pattern or divided into several sections. Certain patterns are only used in certain sections of the cloth. For example, a row of isosceles triangles, forming the pasung motif, as well as diagonal floral motifs called dhlorong, are commonly used for the head. However, pasung and dhlorong are occasionally found in the body. Other motifs such as buketan (flower bouquet) and birds are commonly used in either the head or the body. The head is a rectangular section of the cloth which is worn at the front. The head section can be at the middle of the cloth, or placed at one or both ends. The papan inside of the head can be used to determine whether the cloth is kain panjang or sarong. The body is the main part of the cloth, and is filled with a wide variety of patterns. The body can be divided into two alternating patterns and colours called pagi-sore ('dawn-dusk'). Brighter pattern are shown during the day, while darker pattern are shown in the evening. The alternating colours give the impression of two batik sets. Margins are often plain, but floral and lace-like patterns, as well as wavy lines described as a dragon, are common in the area beside seret. As each region has its own traditional pattern, batiks are commonly distinguished by the region they originated in, such as batik Solo, batik Yogyakarta, batik Pekalongan, and batik Madura. Batiks from Java can be distinguished by their general pattern and colours into batik pedalaman (inland batik) or batik pesisir (coastal batik). Batiks which do not fall neatly into one of these two categories are only referred to by their region. A mapping of batik designs from all places in Indonesia depicts the similarities and reflects cultural assimilation within batik designs. A typical inland batik has deep earthy colours with various indigenous patterns (contemporary kain panjang with sidha pattern from Solo). Inland batik or batik kraton (Javanese court batik) is the oldest form of batik tradition known in Java. Inland batik has earthy colour such as black, indigo, brown, and sogan (brown-yellow colour made from the tree Peltophorum pterocarpum), sometimes against a white background, with symbolic patterns that are mostly free from outside influence. Certain patterns are reserved for royalty, while other are worn on specific occasions. At a Javanese wedding for example, the bride wears specific patterns at each stage of the ceremony. Noted inland batiks are produced in Solo and Jogjakarta, cities traditionally regarded as the centre of Javanese culture. Batik Solo typically has sogan background and is preserved by the Susuhunan and Mangkunegaran Court. Batik Jogja typically has white background and is preserved by the Yogyakarta Sultanate and Pakualaman Court. In contrast, a typical coastal batik has vibrant colours with patterns drawn from numerous cultures (kain panjang with lotus motifs from Semarang, 1880). Coastal batik is produced in several areas of northern Java and Madura. In contrast to inland batik, coastal batiks have vibrant colours and patterns inspired by a wide range of cultures as a consequence of maritime trading. Recurring motifs include European flower bouquets, Chinese phoenix, and Persian peacocks. Noted coastal batiks are produced in Pekalongan, Cirebon, Lasem, Tuban, and Madura. Pekalongan has the most active batik industry. A notable sub-type of coastal batik called Jawa Hokokai is not attributed to a particular region. During the Japanese occupation of Indonesia in early 1940, the batik industry greatly declined due to material shortages. The workshops funded by the Japanese however were able to produce extremely fine batiks called Jawa Hokokai. Common motifs of Hokokai includes Japanese cherry blossoms, butterflies, and chrysanthemums. Another coastal batik called tiga negeri (batik of three lands) is attributed to three regions: Lasem, Pekalongan, and Solo, where the batik would be dipped in red, blue, and sogan dyes respectively. As of 1980, batik tiga negeri was only produced in one city. Sundanese or Priangan Batik is the term for batik from the Priangan region of West Java and Banten. Although Priangan batiks can use a wide range of colours, a preference for indigo is seen in some of its variants. Natural indigo dye made from Indigofera is among the oldest known dyes in Java, and its local name tarum has lent its name to the Citarum river and the Tarumanagara kingdom, which suggests that ancient West Java was once a major producer of natural indigo. Noted Priangan batik is produced in Ciamis, Garut, and Tasikmalaya. Other traditions include Batik Kuningan influenced by batik Cirebon, batik Banten that developed quite independently, and an older tradition of batik Baduy. Batik Banten employs bright pastel colours and represents a revival of a lost art from the Sultanate of Banten, rediscovered through archaeological work during 2002–2004. Twelve motifs from locations such as Surosowan and several other places have been identified. Batik Baduy only employs indigo colour in shades ranged from bluish black to deep blue. It is traditionally worn as iket, a type of Sundanese headress similar to Balinese udeng, by Outer Baduy people of Lebak Regency, Banten. Trade relations between the Melayu Kingdom in Jambi and Javanese coastal cities have thrived since the 13th century. Therefore, coastal batik from northern Java probably influenced Jambi. In 1875, Haji Mahibat from Central Java revived the declining batik industry in Jambi. The village of Mudung Laut in Pelayangan district is known for producing batik Jambi. Batik Jambi, as well as Javanese batik, influenced the Malaysian batik. The Minangkabau people also produce batik called batiak tanah liek (clay batik), which use clay as dye for the fabric. The fabric is immersed in clay for more than 1 day and later designed with motifs of animal and flora. The Batik from Bengkulu, a city on west coast of Sumatra, is called Batik Besurek, which literary means "batik with letters" as they draw inspiration from Arabic calligraphy. Batik making in the island of Bali is relatively new, but a fast-growing industry. Many patterns are inspired by local designs, which are favoured by the local Balinese and domestic tourists. Objects from nature such as frangipani and hibiscus flowers, birds or fishes, and daily activities such as Balinese dancer and ngaben processions or religious and mythological creatures such as barong, kala and winged lion are common. Modern batik artists express themselves freely in a wide range of subjects. Contemporary batik is not limited to traditional or ritual wearing in Bali. Some designers promote batik Bali as elegant fabric that can be used to make casual or formal cloth. Using high class batik, like hand made batik tulis, can show social status. 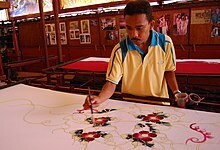 A batik craftsman making batik. Malaysian batik are usually patterned with floral motifs with light colouring. Batik was mentioned in the 17th century Malay Annals. The legend goes when Laksamana Hang Nadim was ordered by Malacca King, Sultan Mahmud, to sail to India to buy 140 pieces of serasah cloth (batik) with 40 types of flowers depicted on each. Unable to find any that fulfilled the requirements explained to him, he made up his own. On his return unfortunately his ship sank and he only managed to bring four pieces, earning displeasure from the Sultan. The method of Malaysian batik making is different from those of Indonesian Javanese batik, the pattern being larger and simpler with only occasional use of the canting to create intricate patterns. It relies heavily on brush painting to apply colours to fabrics. The colours also tend to be lighter and more vibrant than deep coloured Javanese batik. The most popular motifs are leaves and flowers. Malaysian batik often displays plants and flowers to avoid the interpretation of human and animal images as idolatry, in accordance with local Islamic doctrine. However, the butterfly theme is a common exception. Indians are known to use resist method of printing designs on cotton fabrics, which can be traced back 2000 years. Initially, wax and even rice starch were used for printing on fabrics. Until recently batik was made only for dresses and tailored garments, but modern batik is applied in numerous items, such as murals, wall hangings, paintings, household linen, and scarves, with livelier and brighter patterns. Contemporary batik making in India is also done by the Deaf women of Delhi, these women are fluent in Indian Sign Language and also work in other vocational programs. Over the past century, batik making in Sri Lanka has become firmly established. The Sri Lankan batik industry is a small scale industry which can employ individual design talent and mainly deals with foreign customers for profit. It is now the most visible of the island's crafts with galleries and factories, large and small, having sprung up in many tourist areas. Rows of small stalls selling batiks can be found all along Hikkaduwa's Galle Road strip. Mahawewa, on the other hand, is famous for its batik factories. Batik is done by the ethnic people in the South-West of China. The Miao, Bouyei and Gejia people use a dye resist method for their traditional costumes. The traditional costumes are made up of decorative fabrics, which they achieve by pattern weaving and wax resist. Almost all the Miao decorate hemp and cotton by applying hot wax then dipping the cloth in an indigo dye. The cloth is then used for skirts, panels on jackets, aprons and baby carriers. Like the Javanese, their traditional patterns also contain symbolism, the patterns include the dragon, phoenix, and flowers. In Africa, where batik was originally imported by Dutch merchants from Indonesia (then the Netherlands East Indies), paste made from starch or mud is used as a resist instead of wax. The most developed resist-dyeing skills are to be found in Nigeria where the Yoruba make adire cloths. Two methods of resist are used: adire eleso which involves tied and stitched designs and adire eleko that uses starch paste. The paste is most often made from cassava starch, rice, and other ingredients boiled together to produce a smooth thick paste. The Yoruba of West Africa use cassava paste as a resist while the Soninke and Wolof people in Senegal uses rice paste. The Bamana people of Mali use mud as a resist. Parang klithik pattern from Solo. Sidha Drajat pattern from Solo. Typical bright red colour in batik Lasem called abang getih pithik (chicken blood red). Head of a sarong from Banyumas, circa 1880s. Pasung or pucuk rebung pattern, circa 1800s. Sarong from northern Java, circa 1900s. Initial pattern drawn with a pencil. Drawing patterns with wax using canting. Various tools for making batik, canting is shown in the top. A cap for applying hot wax. Dyeing the cloth in colour. A group of women wearing colourful batiks. A Javanese man wearing typical contemporary batik shirt. Studio portrait from the court of Yogyakarta. Portrait of a woman in sarong and kebaya with child. ^ a b "What is Batik?". The Batik Guild. ^ The Jakarta Post Life team. "Batik: a cultural dilemma of infatuation and appreciation". The Jakarta Post. ^ Robert Pore (12 February 2017). "A unique style, Hastings artist captures wonder of crane migration". The Independent. ^ Sucheta Rawal (4 October 2016). "The Many Faces of Sustainable Tourism - My Week in Bali". Huffingtonpost. ^ a b c d e f g h i j Sumarsono, Hartono; Ishwara, Helen; Yahya, L.R. Supriyapto; Moeis, Xenia (2013). Benang Raja: Menyimpul Keelokan Batik Pesisir. Jakarta: Kepustakaan Populer Gramedia. ISBN 978-979-9106-01-8. ^ ""Indonesian Batik", Inscribed in 2009 on the Representative List of the Intangible Cultural Heritage of Humanity". UNESCO. Archived from the original on 12 October 2014. Retrieved 10 October 2014. ^ Blust, Robert (Winter 1989). "Austronesian Etymologies - IV". Oceanic Linguistics. 28 (2): 111–180. doi:10.2307/3623057. JSTOR 3623057. ^ a b "Batik in Africa". The Batik Guild. Retrieved 29 April 2014. ^ "Batik in Java". The Batik Guild. Retrieved 29 April 2014. ^ "Keunikan Makna Filosofi Batik Klasik: Motif Jlamprang" (in Indonesian). Fit in line. 19 July 2013. Retrieved 1 May 2014. ^ "Prajnaparamita and other Buddhist deities". Volkenkunde Rijksmuseum. Archived from the original on 2 May 2014. Retrieved 1 May 2014. ^ Museum of Cultural History, Oslo: Malaysia - Batikktradisjoner i bevegelse. Retrieved 29 April 2014. ^ a b Charan. "Indian batik: Another Ancient Art of Printing on Textiles". Retrieved 30 April 2014. ^ a b c UNESCO - Intangible Heritage Section. "UNESCO Culture Sector - Intangible Heritage - 2003 Convention :". unesco.org. ^ "Batik: The Forbidden Designs of Java - Australian Museum". australianmuseum.net.au. ^ "Batik patterns hold deep significance". thejakartapost.com. Archived from the original on 2 May 2014. ^ a b "Batik Days". The Jakarta Post. 2 October 2009. ^ "Ingat, Besok Hari Batik Nasional, Wajib Pakai Batik". setkab.go.id. Archived from the original on 3 October 2013. Retrieved 1 October 2013. ^ "Mengupas Center for Complexity Surya University". Retrieved 12 March 2015. ^ "Book Review – Batik: Creating an Identity". WhyGo Indonesia. Archived from the original on 13 July 2011. ^ a b "Nomination for inscription on the Representative List in 2009 (Reference No. 00170)". UNESCO. 2 October 2009. Retrieved 15 April 2014. ^ a b "Administration calls for all-in batik day this Friday". thejakartapost.com. ^ "Let's use batik as diplomatic tool: SBY". thejakartapost.com. Archived from the original on 1 October 2011. ^ Indriasari, Lusiana; Yulia Sapthiani (26 September 2010). "Terbang Bersama Kebaya" (in Indonesian). Female Kompas.com. Retrieved 24 October 2011. ^ Pujobroto, PT (2 June 2010). "Garuda Indonesia Launches New Uniform". Garuda Indonesia.com. Archived from the original on 29 September 2011. Retrieved 24 October 2011. ^ Hokky Situngkir (2 February 2009). "Phylomemetic Tree of Indonesian Traditional Batik". Retrieved 10 May 2014. ^ "Batik Baduy diminati pengunjung Jakarta Fair" (in Indonesian). Antara News.com. 15 June 2012. Archived from the original on 29 July 2013. Retrieved 9 July 2012. ^ "Pesona Batik Jambi" (in Indonesian). Padang Ekspres. 16 November 2008. Archived from the original on 17 August 2013. Retrieved 24 October 2011. ^ a b "Bali Batik, Bali Sarong, Kimono - Bali Textiles, Bali Garment, Clothing - balibatiku.com". balibatiku.com. ^ Dewan sastra. Dewan Bahasa dan Pustaka. 2001. ^ Journal of the Malaysian Branch of the Royal Asiatic Society: 1952. The Branch. 1953. ^ "Figural Representation in Islamic Art". metmuseum.org. ^ Burch, Susan; Kaferq, Alison (2010). Deaf and Disability Studies. Washington D.C: GU Press. p. 52. ISBN 1-56368-464-0. ^ "Sri Lankan Batik Textiles". Lakpura Travels. Retrieved 1 May 2014. ^ Kannangara, Ananda (10 June 2012). "Brighter future for batik industry". Sunday Observer (Sri Lanka). Archived from the original on 2 May 2014. Retrieved 1 May 2014. ^ Kroese, W.T. (1976). The origin of the Wax Block Prints on the Coast of West Africa. Hengelo: Smit. ISBN 9062895018. ^ LaGamma, Alisa (2009). The Essential Art of African Textiles: Design Without End. New York: The Metropolitan Museum of Art. Raffles, Sir Thomas Stamford. (1817) History of Java, Black, Parbury & Allen, London. Sumarsono, Hartono; Ishwara, Helen; Yahya, L.R. Supriyapto; Moeis, Xenia (2013). Benang Raja: Menyimpul Keelokan Batik Pesisir. Jakarta: Kepustakaan Populer Gramedia. ISBN 978-979-9106-01-8. Look up batik in Wiktionary, the free dictionary. Wikimedia Commons has media related to Batik. 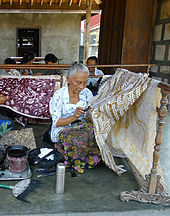 Wikimedia Commons has media related to Indonesian batik. This page was last edited on 2 April 2019, at 00:29 (UTC).